Serena and I just got back from a trip to New Orleans. She had a conference and I was just a hanger-on. I didn't rent a bike this time which I kind of regret but there is enough to do in New Orleans that I wasn't too disappointed. I should also add that I didn't bring our camera so these are cell phone pics, they are okay but you can see the images really get blown out especially at night. The New Orleans PD patrols the streets of the French Quarter on scooters. 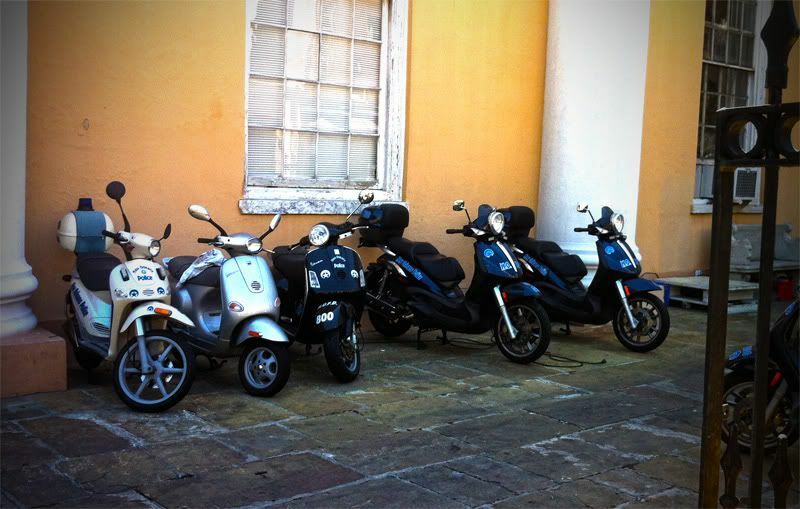 Vespas and Piaggios are their rides of choice. The Natchez Paddle Boat docked on the Mississippi. This was quite a sight and even better sounds. There is a pipe organ on the top and if you look closely top center you can see the organist and the steam coming off the pipes as he is playing. I took an afternoon to check out the Aquarium of the Americas. 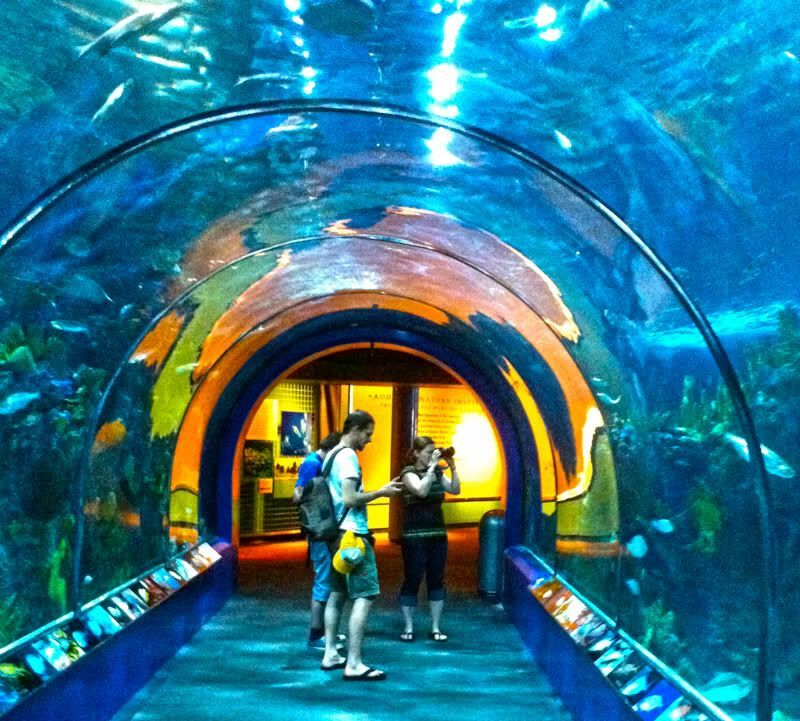 It is very nice and the first thing you see upon entering is the aquarium tunnel where you walk under and through a very large tank. 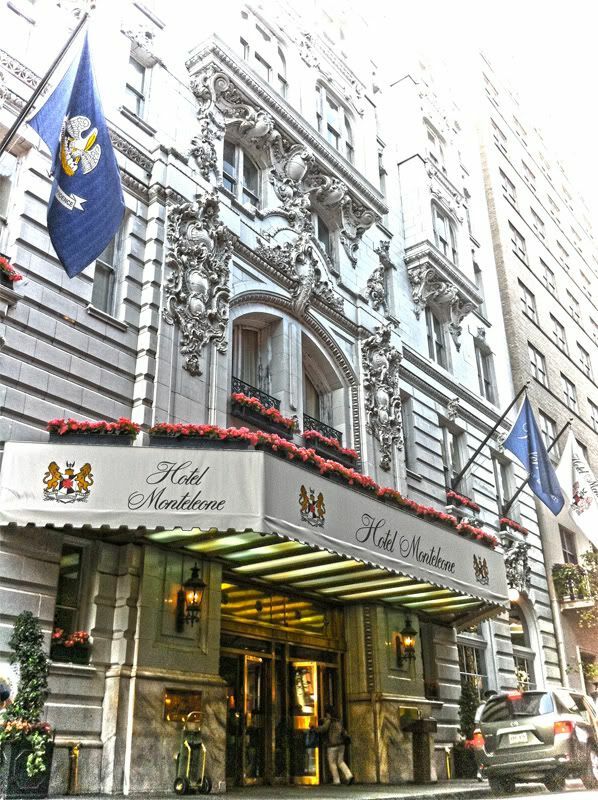 This is the very beautiful Hotel Monteleone. Inside they have a carousel bar that revolves around the bartenders. It takes 15 minutes to make one orbit. It made Serena sick so we hopped off after half way around. 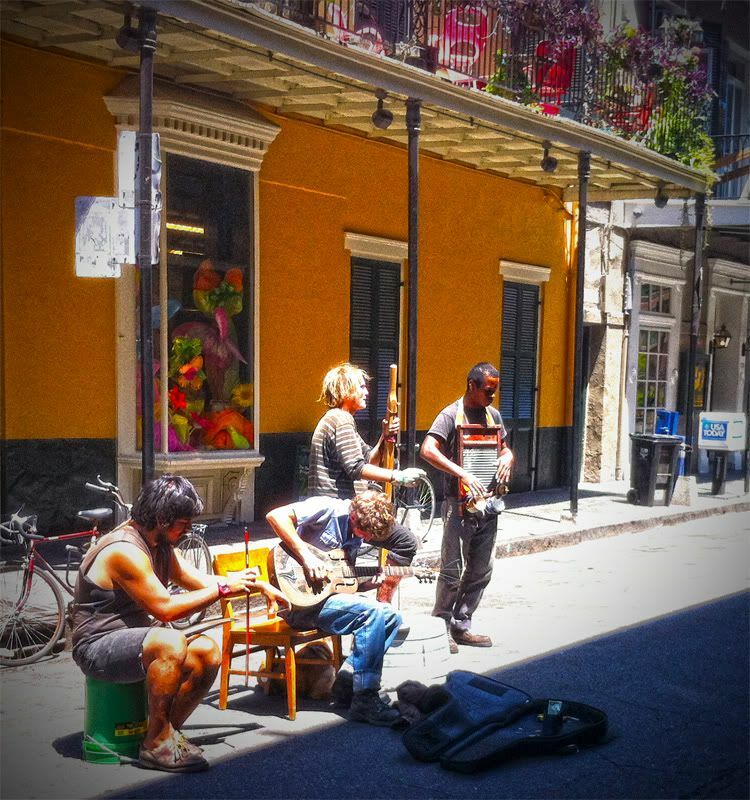 There are incredible street musicians everywhere. This horn group even had a dance couple bouncing around to the tunes. I don't think they were part of the band. These guys had a really unique sound. Most of their instruments are hand made. The guy on the left played a hand saw with a violin bow. The third from the left played a stand-up washtub bass and the last on the right played a washboard. 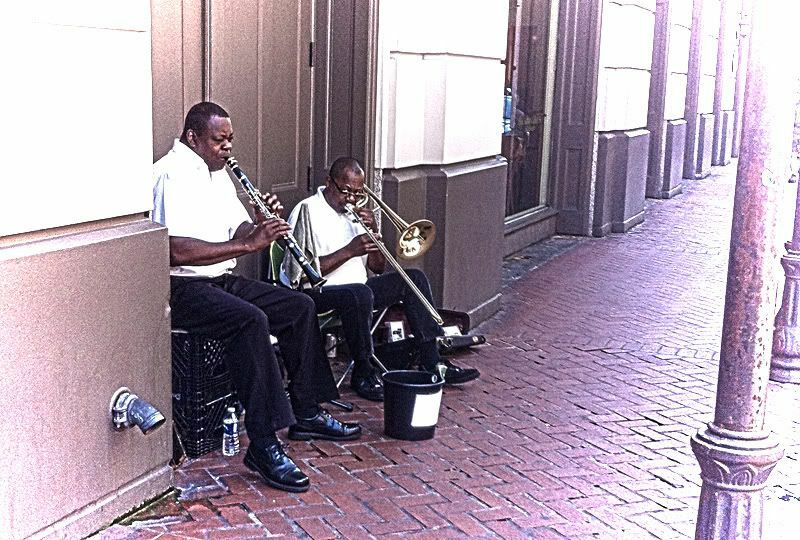 These two were the best musicians I saw on the streets. A clarinet, trombone and clapping for percussion. The man on the left had a powerful bluesy voice. You could tell this guy had been working as a street entertainer for years. Had an entire routine down pat and was very interactive with groups stopping by. 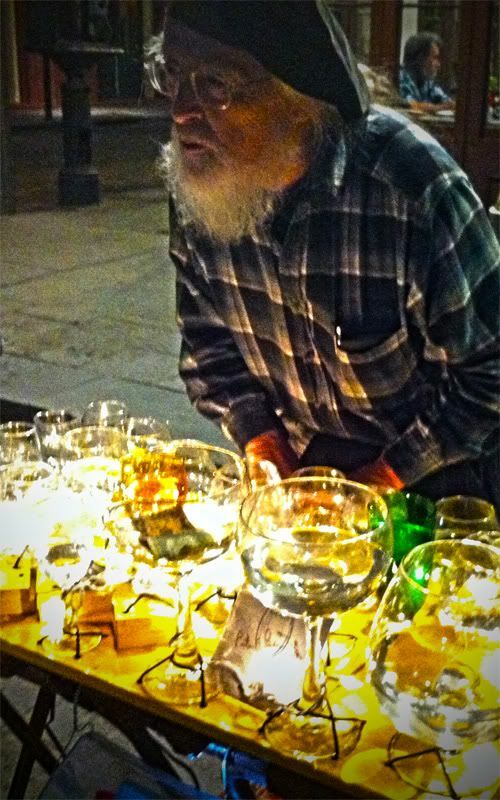 He played the water glasses and also explained the technique and history of his art. Bourbon Street. 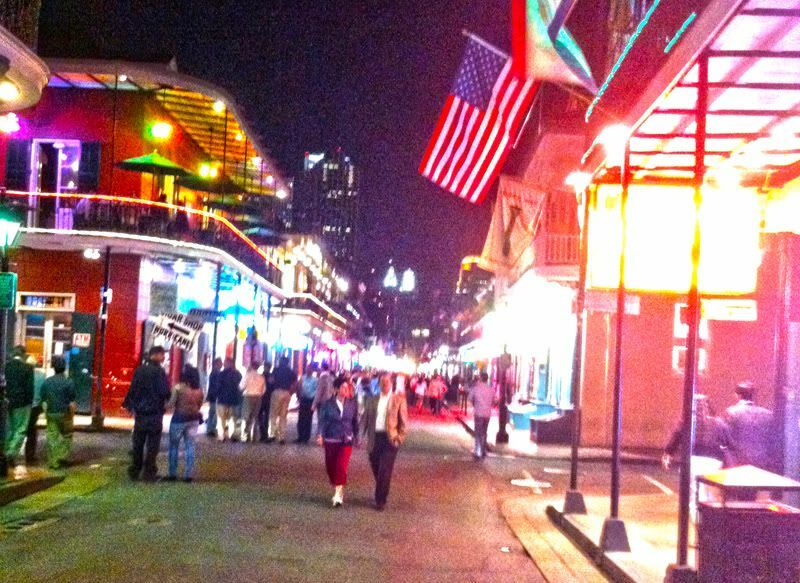 Walking with open alcohol is permitted, at least in the French Quarter if not the entire city. Lots of people partying and lots of drunks. 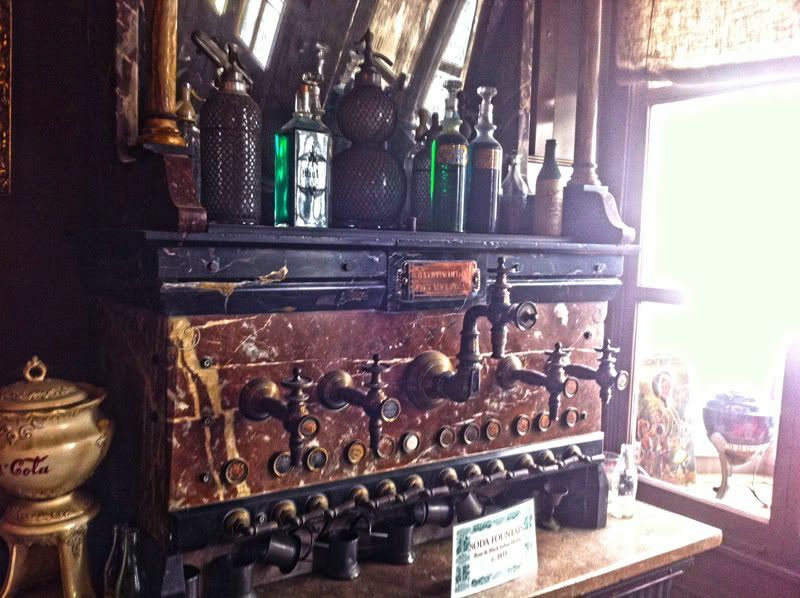 An old soda fountain in the Pharmacy Museum. 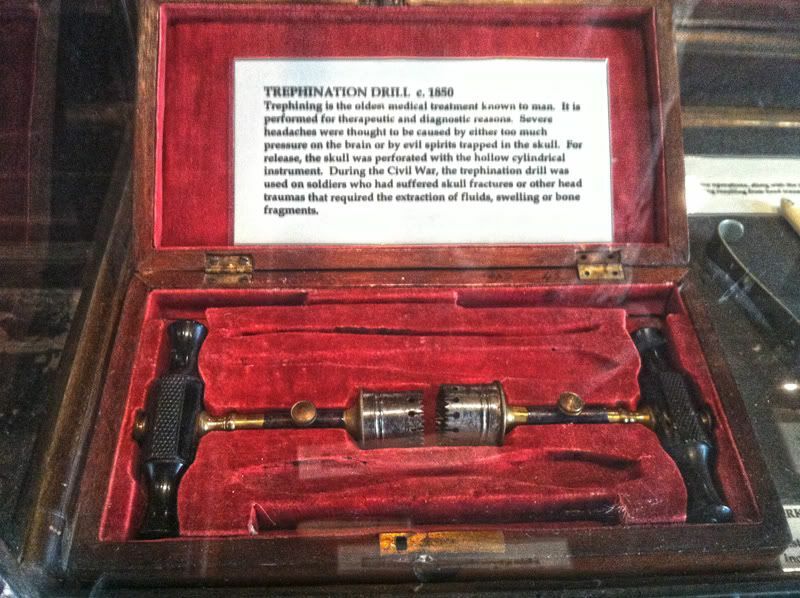 The trephination Drill used to relieve pressure in the head by creating holes. Also in the Pharmacy Museum. 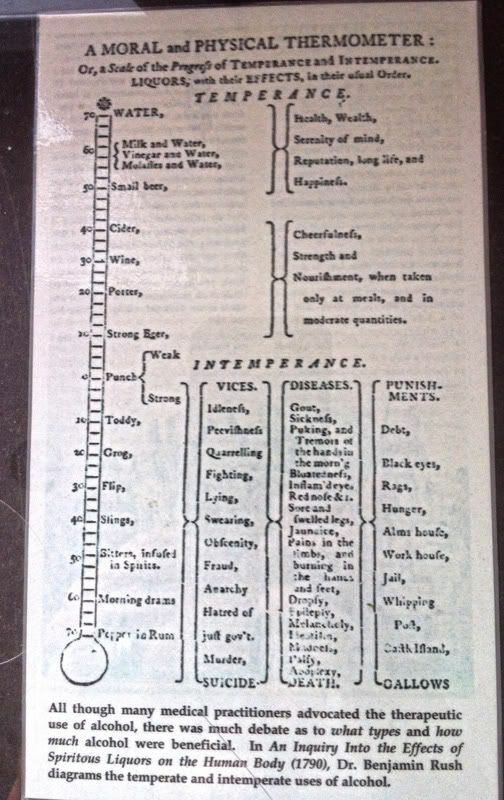 I don't know if you can read this but it is a chart created by a physician on the effects of alcohol and a persons state of well being. Some dubious research to be sure however based upon what I saw on Bourbon Street maybe there is some truth to it. We spent a day at Jazz Fest. Very cool festival with some amazing musicians. Jazz, Blues, Gospel, Zydeco, Rock and Alternative bands were at the different stages. 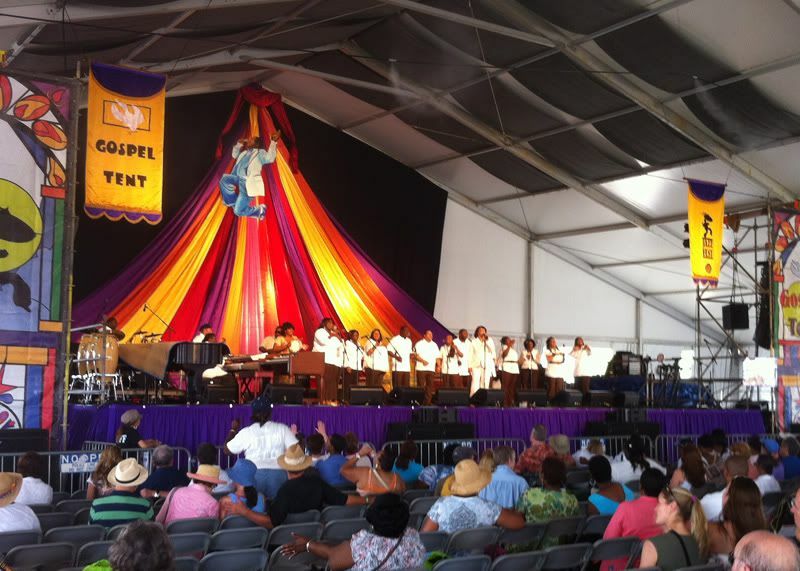 This photo is from the Gospel Tent. Also great creole festival food. The tree lined Espinade Street. 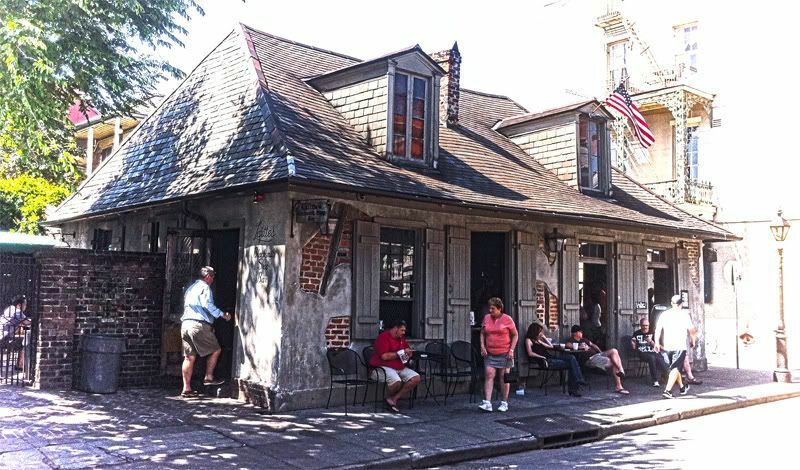 Lafittes Bar, a very popular building in paintings and photographs in the many galleries. One of the many streetcars. 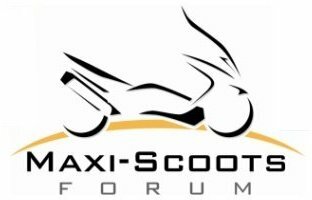 I didn't get a chance to take one for a ride but looked like a fun way to get around. Had a great time and would like to go back soon. Man you sure do get around!!! Some more great photos even if they were taken with a phone. Thanks for sharing!! The trolley shot belongs in a tourist magazine! Thanks for taking us along! You remind me that this is one of my bucket-list destinations. Even the phone shots are motivating, thanks so much. Thanks guys. 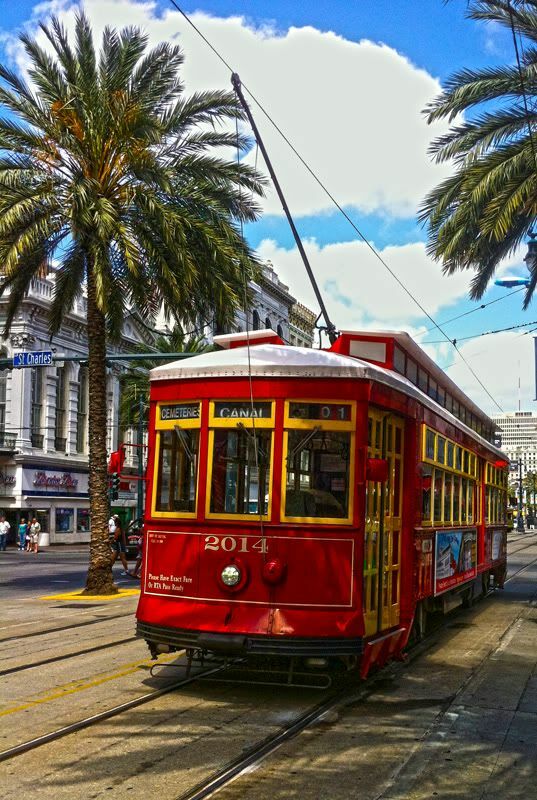 Robin isn't New Orleans close enough for a road trip? New Orleans may now be my favorite city. It's a toss-up between New Orleans, London and Washington DC. I remember taking a day ride on the steamboat in New Orleans back in 1960's. I don't think it was the Natchez back then though I believe it was built in the mid 70's. I think the boat they used back then was called the Delta Queen but I wouldn't swear it. 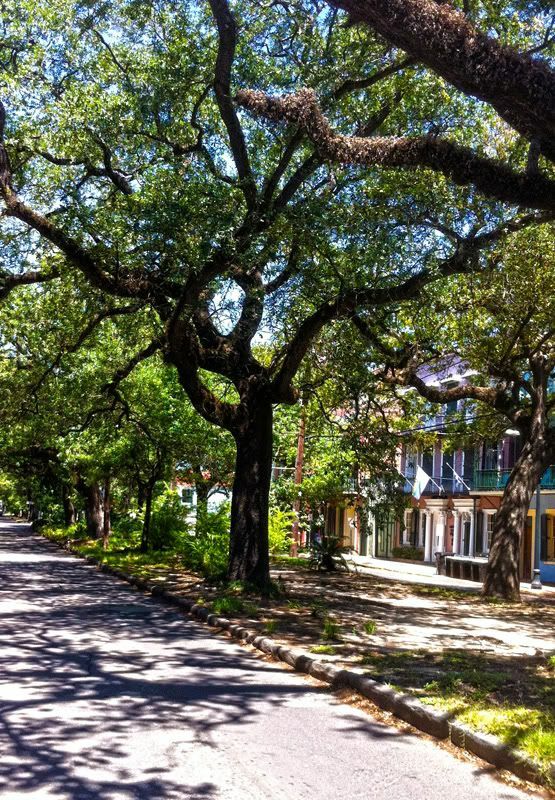 Robin isn't New Orleans close enough for a road trip? It is indeed. I've only been there once, decades ago, and on business so I didn't get out much. I was working at the Hilton and the people there took me out to the quarter one night, that's it. We did a family reunion that started and ended in N'awlins in 2009. We stayed in the quarter and saw most of the sites. My favorite was coffee and beignets at cafe DuMonde and the WWII museum. 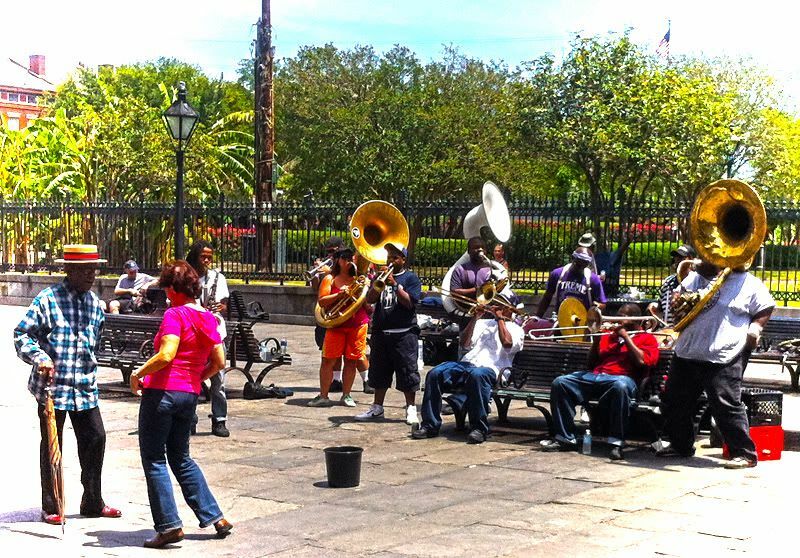 The steam organ on the 'Natchez' can be heard from most places in the square. 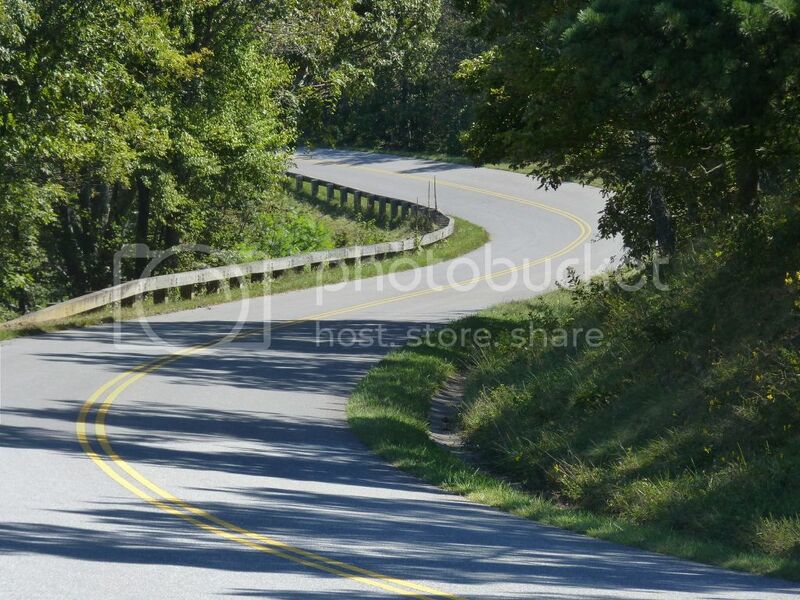 Great selection of pictures and places Dan! No but I did share a plate of them with Serena. I did get a photo of a bird that was eyeing up our beignets.